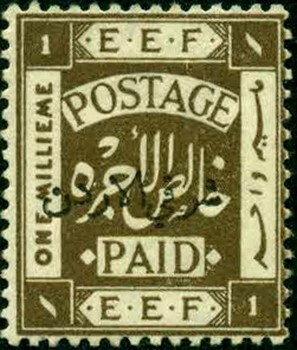 The overprint reads "East of Jordan". † The stamps are either perf 14 of perf 15x14. Gibbons has SG1-8 as perf 15x14 and SG9-19 as perf 14, while Scott liststhem sequentially by value and designates the perf 14 as Sc#a. 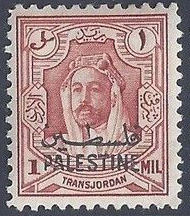 Floyd A. Walker (see Syria) writes, " JORDAN went from being a British Mandate (#1) to a kingdom (#221) and has remained mercifully stable. " 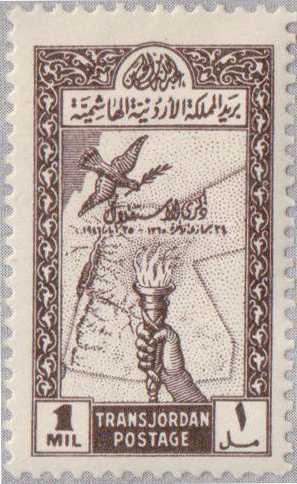 Gibbons  states, "On the day after the proclamation of the state of Israel on 14 May 1948, Transjordan troops (the Arab Legion) crossed the Jordan into Palestine and, before the armistice of 3 April 1949 were able to take and hold the Old City of Jerusalem [and other areas] … The occupied areas were incorporated into the Kingdom … after which the stamps of Jordan were used]. In the Six Day War … all this territory was lost by Jordan and it has since been administered by Israel.